2018 is just a few days ago. Every e-commerce owner, Magento website developer and web designers are trying their best to come up with new marketing technology stacks and utilizing the best-derived inputs for every project decision making. Social media platforms are expanding over the years. Every owner takes a step forward in order to increase his business growth and this can be possible by adopting the new ways and techniques. A wide range of social media platforms are available and every platform has its own pros and cons. It all depends on the user how he is utilizing and taking benefit out of it to grow his business. In today’s scenario, it is must for every business whether the tangible or digital need to have a perfect online presence. The market and the customers will come to know about your business only when you will have your position and name in the market. Taping into the right social media platforms like Facebook, Twitter, Instagram, Linkedin, Youtube and others will work only when you will utilize them in a right way. Your online presence on the social media platforms will let you interact with customers and build good relations with them. Social media marketing or social media platforms are like nerves in the body. If the flow in one vein stops, every process will get disturbed. So to have a good workflow and get the desired results it is must concentrate on the aspects of interacting with online customers to checking your inbox there are other so many things which you can utilize. Every year comes with new technological advancements with so many upgradations in the shopping ways and business marketing ideas. 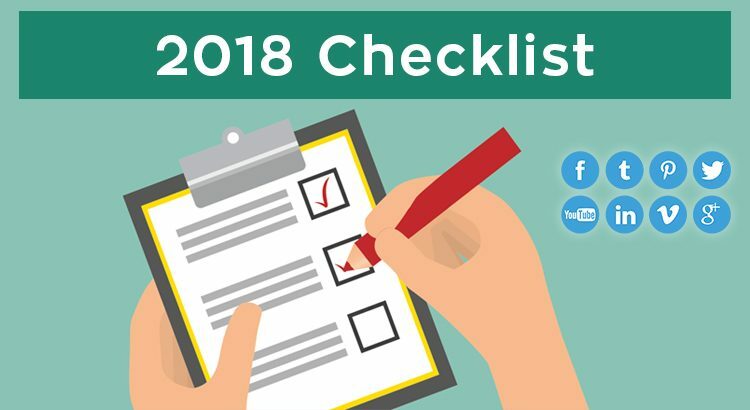 Here is the checklist for 2018 for all the social media marketers who are going to organize a social media campaign at full velocity in the coming days. Let’s have an insight into the ways the E-commerce Magento developers, e-commerce marketers, social media marketers, web designers and the business owners can be benefited out of it. Let’s make 2018 a year of success for all the people working on or for e-commerce sites by keeping in consideration these below mentioned ways. This is the time when social media marketers really need to move a step ahead in their marketing ways without wasting their time and utilizing all the social media features to provide an insight into everything your competitors are doing. 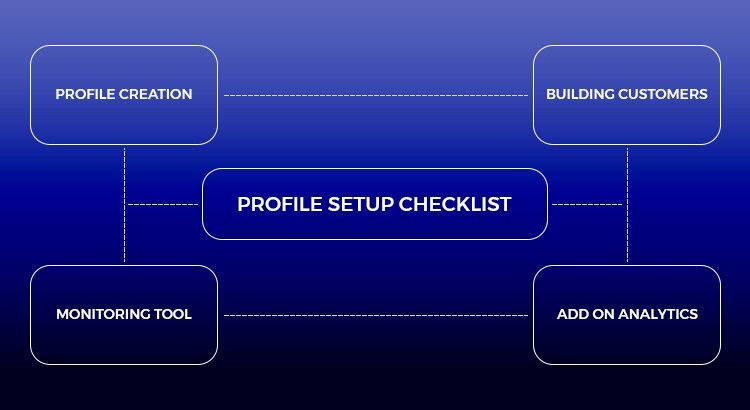 Let’s begin with the first thing is Profile setup checklist. Every social media marketer before starting with anything must keep the checklist in mind and then commence with his work. Creating the business profile on different platforms is not a tough task but getting the appropriate audience on all the platforms is what you require. Every business owner will utilize different platforms and monitor all the platforms sometimes become a difficult task so for that purpose setting up another analytics is preferable. This is the very first step as after a complete research about the target audience business must create the profile on social media sites. It is not mandatory for every business to make their profile on so many social media sites rather the owner must decide the platform where he will get the more significant ROI and then utilize the best strategy. 2018 will be the year for the businesses who have not yet tap into the social selling. Not every business runs with a motive of earning money all the time. Building good and potential customers for your business can be done with different online platforms. It’s really not an immediate process that you have made a profile on social sites and you will immediately get the customers. In order to have speedy results, it is a plus point to link your profile to your blog, in email footers and doesn’t forget to link from different web pages and guests posts. These are really very simple steps to follow and add the audience to your site. It is really a tough task to handle so many profiles at the same time and know their working and replying the customers and posting your posts separately is really time taking the process and many businesses lack here. Here you need to act cleverly and try to integrate the things with social media management tools. There are so many tools available to manage your different social media accounts and this will really help you in time-saving strategy with good outcomes. Another benefit you can take from your social media profile is to run your ads and get an insight into all your social media users on your website. You can regularly keep a check where you are dropping and give a chance to you to re-market them with different prospects. You can do paid advertising on Facebook, Instagram and others. The owners need to stay in touch with their clients and customers and carried out their daily tasks it indicates that he needs to be a multitasking person who will have to manage the things and stay in touch with customers. 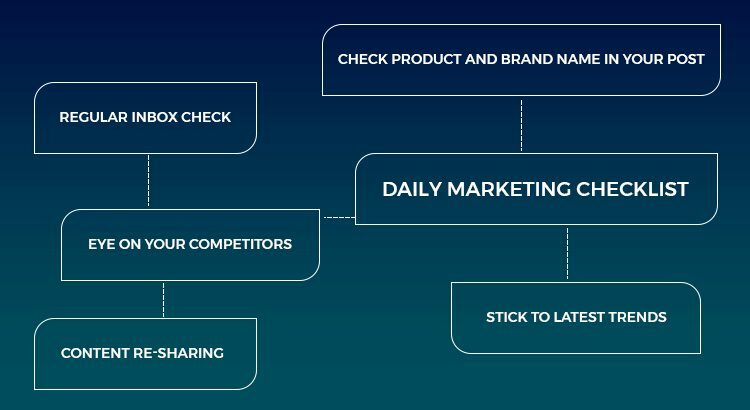 Preparing a daily checklist for your social media marketing strategies can help you divide your work focusing on every aspect. This is one of the vital aspects as not every user would like to comment on the post or image rather they prefer to inquire through private message or direct message. Whenever you will start with your social media then try to go through your inbox messages. Here your quantity and quality of reply will matter. Try not always to send your previously prepared message rather understand what the user is asking and reply them accordingly with a best satisfactory answer. Do not forget to double check your brand name or product name while mentioning it in your post. If you are using any of your brand hashtags then also check it twice. You must react to all the users and try to respond their comments whether good or bad this will help in better customer engagement and will also help to build good relations. For this purpose, you need to have social media managing tools so that you can manage the things and your posts easily by replying to the users. Re-Posting or Re-sharing your content will also leave a good impression. You must check this with the users who are sharing your post and re-share it on your wall to make other brands or people aware of the things how people are finding your content valuable. This thing will help in creating awareness about your brand in the market. One vital thing to keep in mind is always trying not to share only your content rather make the audience aware of the things related to your market. It’s not bad to stay focus on your social media strategies but in addition to this make sure you devote your time to see what your competitors are doing for the growth. It is not a big deal that you and your competitors might have same audience but to foster the engagement you need to try something out of the box to attract them more towards you. Not only keeping an eye on the competitors will work rather you must opt for the latest trends to let your brand stand out in a crowd. Try opting for some page optimization strategies so that you can make your buyers love the experience of your site while making their purchase with you. You must also check the latest content trends and by adopting these trends you can easily boost your audience engagement on social media sites. Many times you observe that your website and social media traffic goes down when there is any holiday or any occasion. Every day comes with new strategies and hopes to start with brilliant things. In a day you commit mistakes and learn from those mistakes and try not to commit next time. For not letting your traffic goes down you must include various weekly or monthly tasks in your social media marketing checklist. No more worry about the holiday traffic as you can schedule your content to post it whenever you want. This scheduling is totally dependent on you. The best way is to schedule your post weekly as delayed posting will break the link between the engager and you. For this, you must have a complete balance when to post and on which platform. 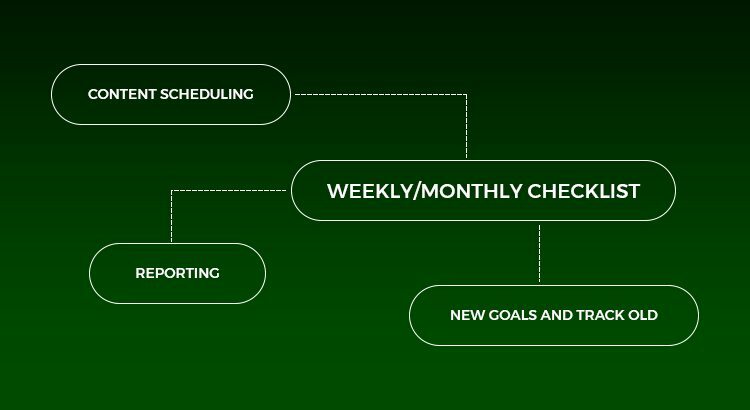 When you are planning your weekly or monthly tasks then meanwhile you can check the status of your goal and if you think it’s going to be accomplished then plan for a new goal during that period to get more success for your business. If you detect something is not working perfectly while tracking your performance then you can work on it to hit your goal. Your regular reports of different social media accounts will help you to a great extent as this would let you know the actual growth of your business. These reports will help the decision makes to take the next step towards the growth. In the above-mentioned checklist, everything has its own impact rather every way have its own merits and demerits. If you cannot go for everything at once then prepare a strategy and plan the things step-by-step.